Half Moon Cottage01263 715779work01603 870304fax Self-cateringHalf Moon Cottage is an attractive single storey, thatched cottage for two in a woodland setting. This charming open plan, studio-style cottage is one of three pretty cottages that can be booked together or separately. The cottage is just a mile away from the seaside in the lovely coastal village of West Runton. 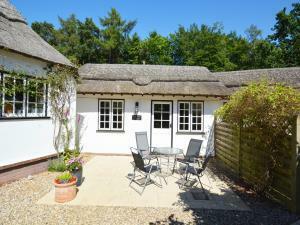 Half Moon Cottage is an attractive single storey, thatched cottage for two in a woodland setting. This charming open plan, studio-style cottage is one of three pretty cottages that can be booked together or separately. The cottage is just a mile away from the seaside in the lovely coastal village of West Runton.